Innovations in management are becoming more numerous and diverse, and are appearing in organizations providing many different kinds of products and services. The purpose of this book is to examine whether some widely-promoted examples of these management innovations – ranging from techniques such as Kaizen to styles of leadership and the management of learning – can usefully be applied to organizations which provide healthcare, and applied in different kinds of health systems. 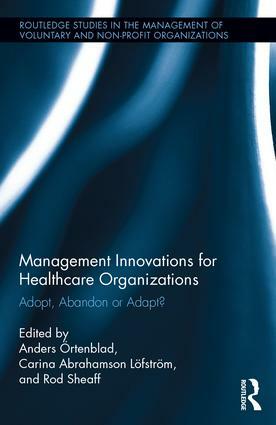 Management Innovations for Healthcare Organizations is distinctive in selecting a wide and diverse range and selection of managerial innovations to examine. No less distinctively, it makes an adaptive, critical scrutiny of these innovations. Neither evangelist nor nihilist, the book instead considers how these innovations might be adapted for the specific task of providing healthcare. Where evidence on these points is available, the book outlines that too. Consequently the book takes an international approach, with contributions from Europe, the Middle East, Australia and North America. Each contributor is an expert in the management innovation which they present. This combination of features makes the book unique. Anders Örtenblad is a Professor of Organization and Leadership at the University of Nordland, Bodø, Norway. Carina Abrahamson Löfström is a Researcher at The Gothenburg Region Association of Local Authorities, Sweden. Rod Sheaff is Professor of Health Services Research at Plymouth University, UK. Voluntary and non-profit organizations are playing an increasingly significant role, worldwide, in the provision and management of public services. Drawing together significant and ground breaking research, this series will be essential reading for students of public policy and management as well as the thinking manager. Topics covered include the management of innovation and change, financial management, performance evaluation and management and organizational development and project management.